Model selection for penalized graphical models using the Stability Approach to Regularization Selection ('StARS'), with options for speed-ups including Bounded StARS (B-StARS), batch computing, and other stability metrics (e.g., graphlet stability G-StARS). Christian L. Müller, Richard Bonneau, Zachary Kurtz (2016) . Probabilistic graphical models (Lauritzen (1996)) have become an important scientific tool for finding and describing patterns in high-dimensional data. Learning a graphical model from data requires a simultaneous estimation of the graph and of the probability distribution that factorizes according to this graph. In the Gaussian case, the underlying graph is determined by the non-zero entries of the precision matrix (the inverse of the population covariance matrix). Gaussian graphical models have become popular after the advent of computationally tractable estimators, such as neighborhood selection (Meinshausen and Bühlmann (2010)) and sparse inverse covariance estimation (Banerjee, El Ghaoui, and D’Aspremont (2008), Yuan and Lin (2007)). State-of-the-art solvers are the Graphical Lasso (GLASSO) (Friedman, Hastie, and Tibshirani (2008)) and the QUadratic approximation for sparse Inverse Covariance estimation (QUIC) method (Hsieh et al. (2014)). Any neighborhood selection and inverse covariance estimation method requires a careful calibration of a regularization parameter “λ” (lambda) because the actual model complexity is not known a priori. State-of-the- art tuning parameter calibration schemes include cross-validation, (extended) information criteria (IC) such as Akaike IC and Bayesian IC (Yuan and Lin (2007); Foygel and Drton (2010)), and the Stability Approach to Regularization Selection (StARS) (Liu, Roeder, and Wasserman (2010)). The StARS method is particularly appealing because it shows superior empirical performance on synthetic and real-world test cases and has a clear interpretation: StARS seeks the minimum amount of regularization that results in a sparse graph whose edge set is reproducible under random subsampling of the data at a fixed proportion β (Zhao, Liu, and Roeder (2012)). Regularization parameter selection is thus determined by the concept of stability rather than regularization strength. Two major shortcomings in StARS are computational cost and optimal setting of beta. StARS must repeatedly solve costly global optimization problems (neighborhood or sparse inverse covariance selection) over the entire regularization path for N sets of subsamples (where the choice of N is user-defined). Also, there may be no universally optimal setting of β as edge stability is strongly influenced by the underlying unknown topology of the graph (Ravikumar et al. (2011)). We alleviated both of these shortcomings (see Müller, Bonneau, and Kurtz (2016)). Firstly, we speed up StARS by proposing β-dependent lower and upper bounds on the regularization path from as few as N = 2 subsamples (Bounded StARS (B-StARS)). This implies that the lower part of regularization path (resulting in dense graphs and hence computationally expensive optimization) does not need to be explored for future samples without compromising selection quality. Secondly, we generalized the concept of edge stability to induced subgraph (graphlet) stability. We use the graphlet correlation distance (gcd) (Yaveroglu et al. (2014)) as a novel variability measure for small induced subgraphs across graph estimates. Requiring simultaneously edge and graphlet stability (gcd+StARS or G-StARS) leads to superior regularization parameter selection on synthetic benchmarks and real-world data. 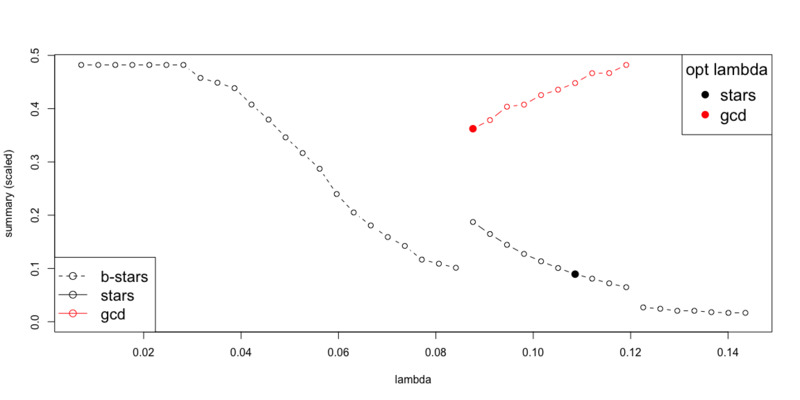 The option to find lower/upper bounds on the StARS-selected lambda from N=2 subsamples works particularly well when the underlying target graphs are sparse or when the dimensionality is high (above 20 variables or so). The bounds greatly reduce computational burden even when running in embarrassingly parallel (batch) mode. In batch computing systems, we use the batchtools Map/Reduce strategy (for batch computing systems such as Torque, LSF, SLURM or SGE) and well as Interactive and multicore, socket, ssh clusters and Docker swams. which can significantly reduce the computation and memory burdens for StARS. This is useful for hpc users, when the number of processors available on a multicore machine would otherwise allow for only modest parallelization. Please see the paper preprint on arXiv. The most recent version of pulsar is on github and installation requires the devtools package. For the purposes of this tutorial suggested but not-imported packages will be prompted as needed (e.g. huge, orca, …). In this example, we will use synthetic data generated from the huge package. You can use the pulsar package to run StARS, serially, as a drop-in replacement for the huge.select function in the huge package. Pulsar differs in that we run the model selection step first and then refit using arguments stored in the original call. Remove the seed argument for real data (this seeds the pseudo-random number generator to fix subsampling for reproducing test code). Including the lower bound option lb.stars and upper bound option ub.stars can improve runtime for same StARS result (referred to as B-StARS in Mueller et al., 2016). Compare runtimes and StARS-selected lambda index for each method. You can pass in an arbitrary graphical model estimation function to fun. The function has some requirements: the first argument must be the nxp data matrix, and one argument must be named lambda, which should be a decreasing numeric vector containing the lambda path. The output should be a list of adjacency matrices (which can be of sparse representation from the Matrix package to save memory). Here is an example from QUIC. We can use pulsar with a similar call. We can also parallelize this a bit for multi-processor machines by specifying ncores (which wraps mclapply in the parallel package). We can use the graphlet correlation distance (gcd) as an additional stability criterion (G-StARS). We could call pulsar again with a new criterion, or simply update the arguments for model we already used. Then, we can use our default approach for selecting the optimal index, based on the gcd+StARS criterion: choose the minimum gcd summary statistic between the upper and lower StARS bounds. For large graphs, we could reduce pulsar run time by running each subsampled dataset in parallel (i.e., each run as an independent job). This is a natural choice since we want to infer an independent graphical model for each subsampled dataset. Enter batchtools. This package lets us invoke the queuing system in a high performance computing (hpc) environment so that we don’t have to worry about any of the job-handling procedures in R.
We also potentially gain efficiency in memory usage. Even for memory efficient representations of sparse graphs, for a lambda path of size L and for number N subsamples we must hold L*N p*p- sized adjacency matrices in memory to compute the summary statistic. batchtools lets us use a MapReduce strategy, so that only one p*p graph and one p*p aggregation matrix needs to be held in memory at any time. For large p, it can be more efficient to read data off the disk. This also means we will need access to a writable directory to write intermediate files (where the batchtools registry is stored). These will be automatically generated R scripts, error and output files and sqlite files so that batchtools can keep track of everything (although a different database can be used). Please see that package’s documentation for more information. By default, pulsar will create the registry directory under R’s (platform-dependent) tmp directory but this can be overridden(regdir argument to batch.pulsar). For generating batchtools, we need a configuration file (supply a path string to conffile argument, a good choice is the working directory) and, for an hpc with a queuing system, a template file. Example config (batchtools.conf.torque.R) and PBS template file (simpletorque.tmpl) for Torque can be found in the inst/config/ and inst/templates/ subdirectories of this repo, respectively. See the batchtools help page for creating templates for other systems. For this example I suggest using batchtools interactive clusters (serial) mode to get things up and running. The necessary config file is included in this package. Since batchtools is not imported by pulsar, it needs to be loaded. Verbosity and progressbar options for batchtools is set by global options. Uncomment cleanup=TRUE to remove registry directory (useful if running through the example code multiple times). It is also possible to run B-StARS in batch. The first two jobs (representing the first 2 subsamples) will run to completion before the final N-2 are run. This serializes the batch mode a bit but is, in general, faster whenever individual jobs require costly computation outside the lambda bounds, e.g., when some of the provided lambda values along the regularization path induce dense graph estimates. To keep the initial two jobs separate from the rest, the string provided to the init argument (“subtwo” by default) is concatenated to the basename of regdir. The registry/id is returned but named init.reg and init.id from batch.pulsar. In real applications, on an hpc, it is important to specify the res.list argument, which is a named list of PBS resources that matches the template file. For example if using the simpletorque.tml file provided here one would provide res.list=list(walltime="4:00:00", nodes="1", memory="1gb") to give the PBS script 4 hours and 1GB of memory and 1 node to the resource list for qsub. Gains in efficiency and run time (especially when paired with lower/upper bound mode) will largely depend on your hpc setup. E.g - do you have sufficient priority in the queue to run your 100 jobs in perfect parallel? Because settings vary so widely, we cannot provide support for unexpected hpc problems or make specific recommendations about requesting the appropriate resource requirements for jobs. One final note: we assume that a small number of jobs could fail at random. If jobs fail to complete, a warning will be given, but pulsar will complete the run and summary statistics will be computed only over the successful jobs (with normalization constants appropriately adjusted). It is up to the user to re-start pulsar if there is a sampling-dependent reason for job failure, e.g., when an outlier data point increases computation time or graph density and insufficient resources are allocated. Banerjee, Onureena, Laurent El Ghaoui, and Alexandre D’Aspremont. 2008. “Model selection through sparse maximum likelihood estimation for multivariate gaussian or binary data.” The Journal of Machine … 9:485–516. http://dl.acm.org/citation.cfm?id=1390696. Foygel, Rina, and Mathias Drton. 2010. “Extended Bayesian Information Criteria for Gaussian Graphical Models.” Arxiv Preprint, 1–14. http://arxiv.org/abs/1011.6640. Friedman, Jerome, Trevor Hastie, and Robert Tibshirani. 2008. “Sparse inverse covariance estimation with the graphical lasso.” Biostatistics (Oxford, England) 9 (3). Department of Statistics, Stanford University, CA 94305, USA.:432–41. Hsieh, Cho-Jui, Mátyás A Sustik, Inderjit S Dhillon, and Pradeep Ravikumar. 2014. “QUIC: Quadratic Approximation for Sparse Inverse Covariance Estimation.” Journal of Machine Learning Research 15:2911–47. http://jmlr.org/papers/v15/hsieh14a.html. Lauritzen, Steffen L. 1996. Graphical models. Oxford University Press. Liu, Han, Kathryn Roeder, and Larry Wasserman. 2010. “Stability approach to regularization selection (stars) for high dimensional graphical models.” Proceedings of the Twenty-Third Annual Conference on Neural Information Processing Systems (NIPS), 1–14. https://papers.nips.cc/paper/3966-stability-approach-to-regularization-selection-stars-for-high-dimensional-graphical-models.pdf. Meinshausen, N, and P Bühlmann. 2010. “Stability selection.” J. R. Stat. Soc. Ser. B Stat. Methodol. 72 (4). Blackwell Publishing Ltd:417–73. https://doi.org/10.1111/j.1467-9868.2010.00740.x. Ravikumar, Pradeep, Martin J. Wainwright, Garvesh Raskutti, and Bin Yu. 2011. “High-dimensional covariance estimation by minimizing L1 -penalized log-determinant divergence.” Electronic Journal of Statistics 5 (January 2010):935–80. https://doi.org/10.1214/11-EJS631. Yaveroglu, Ömer Nebil, Noël Malod-Dognin, Darren Davis, Zoran Levnajic, Vuk Janjic, Rasa Karapandza, Aleksandar Stojmirovic, and Nataša Pržulj. 2014. “Revealing the hidden language of complex networks.” Scientific Reports 4 (January):4547. https://doi.org/10.1038/srep04547. Yuan, Ming, and Yi Lin. 2007. “Model selection and estimation in the Gaussian graphical model.” Biometrika 94 (1):19–35. https://doi.org/10.1093/biomet/asm018. Zhao, Tuo, H Liu, and Kathryn Roeder. 2012. “The huge package for high-dimensional undirected graph estimation in r.” The Journal of Machine Learning Research 13:1059–62. http://dl.acm.org/citation.cfm?id=2343681. Fixed tests that were failing on Windows. Fixed a few typos in the docs. Migrate to the new and improved batchtools for batch.pulsar & related functions. BatchJobs is deprecated. ** Updated how default config files and templates are sourced ** Removed the getTempDir function ** Updated documentation ** Deprecated batch.pulsar progressbar arguments, now controlled by batchtools options. Fixed some failing tests. Small data tests were too sensitive to parameter choices, substituted larger p datasets. Similar fix for problem vignettes.